Earn $300 for every motorcycle Delivery-Partner that signs up with your referral code. Step 2: Have your friend key in your referral code upon sign up. 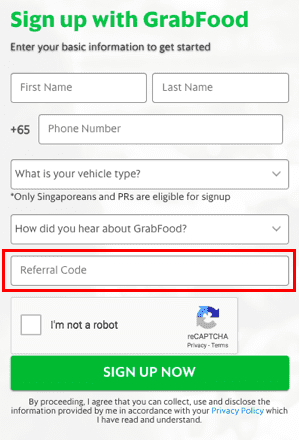 Your friend will input your referral code in the Referral Code Field while signing up at grab.com/sg/driver/food. Note: This is the ONLY place your friend will be able to insert the referral code. Step 3: Have your friend complete the trip criteria for you to receive the sum. No matter which day of the week they are activated, new drivers have 2 weeks FROM their week of activation to complete 30 trips. Once this target is completed, you’ll receive the payment in your wallet! Example 1: James signs up on 17th Dec with his friend’s referral code. He has until Sunday, 6th January 23:59 hours to complete 30 trips to earn his friend the referral reward. Payment will then be made on Tuesday, 8th January. Example 2: Sarah signs up on 21st Dec with her friend’s referral code. She has until Sunday, 6th Jan 23:59 hours to complete 30 trips to earn her friend the referral reward. Payment will be made on Tuesday, 6th January. The referral scheme is only valid if your referred friend is a MOTORCYCLE Delivery Partner. No other vehicle types qualify. Only Active GrabFood Delivery Partners are eligible to earn this referral bonus. GrabCar, GrabHitch, GrabTaxi etc. drivers are NOT Eligible. Delivery Partners cannot terminate their accounts and then re-apply with the code. Their referrers will be ineligible to receive this bonus. The timeline is strictly 2 weeks FROM the week of activation. Count of the trips is based on the trip acceptance time. Trips will be counted only if they are completed successfully.